Categories: building, Fall, Library, parade, performance, puppets | Tags: Halloween, illuminations, inflatables, New York, NYC, parade | Permalink. So we are on for the Halloween Parade again! It starts at 7PM, so meeting at 5:30, at the triangular park at Dominick St, near Spring Street, Halloween proper, so Oct. 31, a Saturday. The theme for the parade in general is “Shine a Light”. 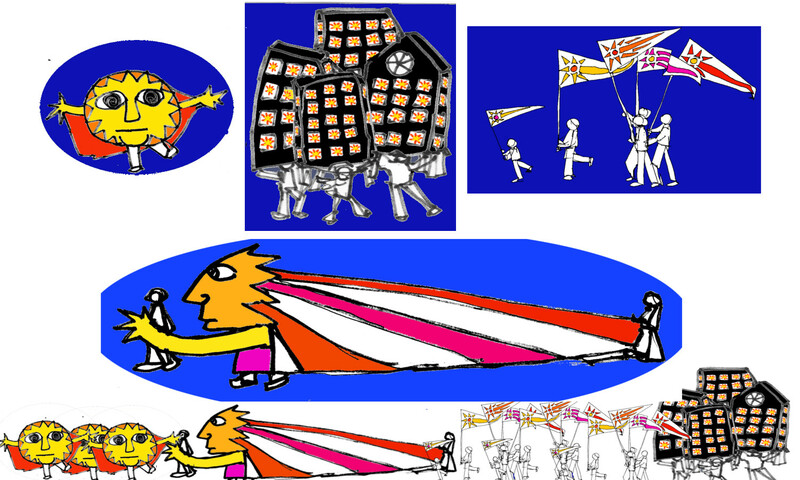 Our parade (“A thousand thousand suns”) will feature the Sun King, Attendant Suns, sun flags, and illuminated inflatable buildings with a sun shining from each window. A picture is attached Dress code (unenforced) will be red, orange yellow, white, and black. Categories: building, Fall, Library, loan, parade, performance, puppets | Tags: Halloween, kids, library, New York, parade, Puppet Free Library, Sun | Permalink.